Tired? Burned out? Weary? The Lord’s work done in His way will never destroy you. Learn what it means to minister unto Him and keep the holy love for Him burning strong even in the midst of intense ministry. A must-read for every believer! Click the image to download your free copy. I want to point out seven things we can be sure of when we do the Lord’s work in His way. What God initiates, He will stand by. Whatever the Lord gave you to do, when you do it His way you can be sure that He will be faithful to you in it until the end. Whether your ministry is administration, giving, serving or showing kindness—if He initiated it, He will stand by it. Consider Moses as one illustration. He didn’t initiate the liberation of the children of Israel. And until the end, God was faithful and took them into the Promised Land. Even though they messed up, God stood by them because He is the One who started it. But be warned—if someone else initiated it or if you started it, I can assure you, it will be nothing but a burden. If you grab for something, it will become a real problem. But if it begins in Him, He will complete it. A life that is committed to wait on Him will always be effective, because the ministry originated with Him is fulfilled by Him. In this kind of a relationship, we will have God’s authority on us. We will have God’s power, provision and protection. When Jesus sent out His disciples in Matthew 28, He shared His authority with them. When He sends us out, He stands by us. In Acts 27, Paul says to those who were on the ship in the storm with him, “I urge you to take heart, for there will be no loss of life among you, but only of the ship. For there stood by me this night an angel of the God to whom I belong and whom I serve” (Acts 27:22–23). Paul was not frightened or scared. There was boldness and authority in him. Heaven knew Paul; heaven recognized him because of the authority that was on his life that came from his relationship with Christ. This kind of ministry will change us into the likeness of Christ. It will lead us into holiness and cause us to love Christ more. It is not the work that will bring about these changes; it is waiting upon the Lord that changes us. When we stand before God, we are transformed. Second Corinthians 3:18 says, “But we all, with unveiled face, beholding as in a mirror the glory of the Lord, are being transformed into the same image from glory to glory, just as by the Spirit of the Lord.” We become like Him as we behold Him. Are you becoming more like Him—the humble One, the broken One, the One who came to serve? When we do the Lord’s work the Lord’s way, we remain faithful and committed to what He has called us to. Second Corinthians 4:1–2 says, “Therefore, since we have this ministry, as we have received mercy, we do not lose heart.” We don’t give up. Not everything is going to go well. There will be hardships, trials and temptations. But the Lord is the One who called us. It is His work, and as we stand before Him, we receive His grace, grace that is sufficient for every season and trial of life. He is coming to you with the reward for you because you waited before Him, you loved Him, you followed Him—you did the Lord’s work in the Lord’s way. © 2004 by KP Yohannan, the president and founder of Gospel for Asia. It was written with the intention of encouraging and edifying the Body of Christ. To learn more about Gospel for Asia or to receive additional free resources, visit Gospel for Asia’s website. Chapter 1 1 Zac Poonen, God-Centered Praying (Bangalore, India: Christian Fellowship Centre, 1971), p. 35. Copyright by Zac Poonen, 6 DaCosta Square, Bangalore– 560084. Chapter 3 1 A.W. Tozer, The Tozer Pulpit—Vol. 1 (Camp Hill, PA: Christian Publications, 1994), pp. 134–136. Chapter 4 1 Madame Guyon, Experiencing the Depths of Jesus Christ—Vol. 2 (Sargent, GA: Seedsowers, 1975), pp. 53–54. Chapter 5 1 Roy Hession, “When I Saw Him . . .”: Where Revival Begins (Fort Washington, PA: CLC, 1975), pp. 17, 21–22. 2 J.C. Metcalfe, Molded by the Cross, ed. Robert Delancy (Fort Washington, PA: CLC, 1997), p. 38. Chapter 6 1 Zac Poonen, Living As Jesus Lived (Bangalore, India: Christian Fellowship Centre, 1977), p. 30. Copyright by Zac Poonen, 6 DaCosta Square, Bangalore– 560084. 2 Ibid. 3 Ibid. Click here, to read more articles about GFA Books, or visit Patheos. This entry was posted in The Lord's Work Done in the Lord's Way and tagged Bible, Christianity, Discipleship, encouragement, gfa, Gospel for Asia, holy spirit, Hope, Jesus, Jesus Christ, K.P. Yohannan, kingdom of God, living water, ministry, Missionaries, Missions, service on June 15, 2010 by gfaseo. Consider the example He gave us in the Gospel of John. All throughout, we see Jesus saying, “The Son can do nothing of Himself, but what He sees the Father do; for whatever He does, the Son also does in like manner” (John 5:19). “I can of Myself do nothing. As I hear, I judge; and My judgment is righteous, because I do not seek My own will but the will of the Father who sent Me” (John 5:30). “I speak what I have seen with My Father” (John 8:38). “For I have not spoken on My own authority; but the Father who sent Me gave Me a command, what I should say and what I should speak” (John 12:49). “The words that I speak to you I do not speak on My own authority; but the Father who dwells in Me does the works” (John 14:10). In all these verses, there is a common element—Jesus did nothing and said nothing apart from the Father. Everything Christ did flowed out from His relationship with the Father. Nothing else and no one else, not even Himself, motivated Jesus to do what He did. Remember when Jesus called His disciples? Nowhere in the Gospels do we read that the Father called the disciples. Jesus went and called the disciples. But when He talked to the Father about them, He said, “I have manifested Your name to the men whom You have given Me out of the world. They were Yours, You gave them to Me” (John 17:6, emphasis mine). Do you see it? The selection of the 12 disciples was not Christ’s choice; it was His Father’s. Jesus was only doing the Father’s will. The night before Jesus called them He didn’t sleep. He “continued all night in prayer to God” (Luke 6:12). All night He stood before His Father waiting for His direction and plan, and “when it was day, He called His disciples to Himself” (Luke 6:13). He didn’t say, “John, Matthew, My Father is calling you.” No. He said, “Come, follow me” (Mark 1:17, NIV). And they followed Him. Another thing we can learn from our Lord as we serve Him, is how He made Himself a servant to the Father. Therefore, it was never external things that motivated Him, but His love for the Father and desire to serve Him and do what He desires. Today there are those who seemingly serve the Lord. They do great things and have such apparently great ministries, but the Lord has nothing to do with it. I know for our movement, there are so many opportunities and challenges we face. There are students to train, leaders to raise up, missionaries to send out. We need to get the job done. There is tremendous opportunity. The list of things to do is so long, the need urgent and the door wide open. It is wonderful that we move forward as best we can to accomplish whatever job the Lord has called us to do. It is good to be driven and focused and moving full speed ahead. We cannot be slothful. Christ was never lazy or slothful. Neither were His disciples. When we enter into this kind of striveless serving, doing simply what He has given us to do, our lives and ministry change. All the murmuring and complaining that come with trying to make things happen cease. There is no scratching your head, pulling out your hair and going nights without sleep, wondering what is going to happen and how the need will be met. Because the work is not dependent on your plans, your meetings or your efforts. You simply allow the Lord to live through you. You enter His rest. This entry was posted in The Lord's Work Done in the Lord's Way and tagged Bible, Christianity, Discipleship, encouragement, gfa, Gospel for Asia, holy spirit, Hope, Jesus, Jesus Christ, K.P. Yohannan, kingdom of God, living water, ministry, Missionaries, Missions, service on June 10, 2010 by gfaseo. When our ministry to the people around us is done as a ministry unto the Lord—doing His work in His way— there will be no striving. There will be no human sweat. Because sweat signifies man’s effort. The first time sweat is mentioned in the Bible is in Genesis 3:19. Because Adam had eaten from the forbidden tree, God told him, “Cursed is the ground for your sake; in toil you shall eat of it all the days of your life. Both thorns and thistles it shall bring forth for you, and you shall eat the herb of the field. In the sweat of your face you shall eat bread” (Genesis 3:17–19). Sweat is a result of the curse that sin brought. Because of it, the ground would not yield its fruit without man’s effort and sweat. Scripture also tells us that those who ministered before the Lord in the inner court were not to wear anything made of wool, anything that would cause them to sweat. “And it shall be, whenever they enter the gates of the inner court, that they shall put on linen garments; no wool shall come upon them while they minister within the gates of the inner court . . . They shall not clothe themselves with anything that causes sweat” (Ezekiel 44:17–18). This is a picture of the kind of service that honors the Lord. Work done out of man’s ability, smartness or money can be a horrible sweat. But when you come to the place in your life at which you begin to live and serve in His strength, you understand what it means to bear His yoke, which is easy and light (see Matthew 11:28). In this way, the assignment He gives you will never destroy you emotionally or physically. It will not tear you apart. Why? Because you are not working in the realm of human talents, resources and strength. You are not producing it out of your own labor and sweat. There is no longer any flesh involved. It is Him—ministry unto Him and empowered by Him. This brings tremendous freedom and liberty to laugh and be content and joyful in whatever comes. It makes no difference whether you are asked to turn the world upside-down or just to be a doorkeeper at the house of God. You simply do the work that He has given you in the strength that He supplies as a ministry unto Him. Is your life full of suspense, frustration and discouragement? Are you worried about the future? Are you anxious and frustrated, discouraged in the ministry and ready to quit? Are you one saying, “This ministry stuff is hard. It’s not fair. I just want to do some ordinary job and have a normal life again”? Maybe you need to learn from the life of the prophet Isaiah. Roy Hession, in his book “When I Saw Him . . .”: Where Revival Begins1 relates Isaiah’s encounter with the Lord. He starts out by describing him, from the first five chapters of Isaiah, as being a man full of anger. As a prophet, he is speaking the words of God, but you can hear his anger and frustration in it all. Isaiah is really sweating. He is trying to do what God called him to do, but in his own strength, ability and sweat. Then in Isaiah 6 something happens. I saw the Lord sitting on a throne, high and lifted up, and the train of His robe filled the temple. Above it stood seraphim; each one had six wings: with two he covered his face, with two he covered his feet, and with two he flew. And one cried to another and said: “Holy, holy, holy is the LORD of hosts; the whole earth is full of His glory!” (Isaiah 6:1–3). Each seraphim had six wings. Notice how only two of the wings were for the work of flying; the other four were used to veil themselves. These were incredibly glorious and beautiful creatures, but the One who sat on the throne was far greater and infinitely more beautiful and awesome. The seraphim didn’t want their presence in any way to divert attention from the One who sat on the throne, so they covered themselves with their wings. Please understand. Isaiah’s ministry was preaching! He was a powerful orator—a prophet! But suddenly, as he stood in God’s presence with the veiled seraphim, he saw how his work, all his service was just filthy rags because it was done in his own strength. He was striving and sweating doing the ministry. The same thing can happen to us when we come into His presence. Our strength, abilities and success become of no importance. In His presence, all else becomes shadows. The strength and effort of ourselves are exposed for the frailty they are compared to His. My brothers and sisters, we must have this type of experience in our ministry. We must continually see the Lord. By this our ministry remains focused on the Holy One, and we live in His presence and minister in His strength. Like the seraphim, the majority of our ministry must be not the work, but be ministering to the Lord—in everything seeking to exalt Him, to magnify Him and to bring all the attention and praise to the One on the throne. Like John the Baptist, we must live with the ministry mindset that “He must become greater; I must become less” (John 3:30, NIV). When God took away Isaiah’s uncleanness, his ministry was transformed and without sweat. The same thing happens to us as we continually come before Him. We are taken up with Him and lost in the wonder of His presence. Then our ministry and what we can do no longer matter; it is only Him and seeking to bring Him glory. My brothers and sisters, this is the way to live! Let us lay down our striving and our sweat and do His work His way. Then there is nothing to get frustrated and worked up about, and our lives bear good fruit that endures for all eternity. How Isaiah was in the first five chapters of the book of Isaiah reminds me of myself in the beginning days of our movement. The preaching I did in many churches during those days was very judgmental and critical. I used kind words, but inside I was angry all the time. I was frustrated. God had told me to do what I was doing, and I was doing it. I expected people to jump up and down in excitement and join with us to see God’s work done, but it wasn’t happening that way at all! Instead, right after I shared about the great need of the lost world, the leaders of these churches would take me out for ice cream, all while having a good time laughing and joking. It was while driving in North Carolina one day, from one meeting to the next, that I simply could not take it anymore. I was so frustrated and angry, trying in every way I knew how to do the ministry He had called me to and still not seeing the results I expected. I was on the road for an hour and a half as the Lord spoke to me. When it was over, I was so thrilled and excited to get to the next meeting place because of the incredible freedom that had just entered my life. I arrived at my meeting and shared, and the Lord touched the hearts of people that night. I couldn’t even remember all that I had said. It was nothing I made happen. Many came forward with tears and repentance. I ministered with the awareness that I was there only because He asked me to come. I represented Christ—that was all I knew. I was free, and what I was doing was only for Him. Nothing else mattered. I wasn’t looking for results. I wasn’t striving any longer. That was one of the significant turning points in my life and in our ministry. What are some sure signs that we are ministering in our own strength? When we seek to do the ministry dependent upon our own strength rather than ministering out of the abundance of a life lived in His presence, three things happen. First, our service becomes self-willed. I see the needs. I make the plans. I have the agendas. I know better. It is ME! Second, our service is by self-effort. It is my effort. It is my work. It is laborious and produces sweat. It is a pain in the neck. Third, it is for self-glory. I get disappointed when people don’t recognize what I have done. It bothers me when people don’t appreciate me or when somebody else gets the appreciation for what I have done. Because my flesh did it, I want something out of it. We are full of our own ways. Jessie Penn-Lewis was a godly woman greatly used in the Welsh revival. In the book, Molded by the Cross, she tells how God dealt with her on this issue. Our service can be just flesh that is consecrated to God. But God does not want flesh consecrated to Him. It is full of wrong motives, stress, worry and sweat. For Isaiah, the answer to the problem was cleansing. He admitted his sin. He said, “Woe is me, for I am undone! Because I am a man of unclean lips” (Isaiah 6:5). The answer is the same for us. No matter where we are in our journey, when we fail in our ministry, beginning to carry things out in our own flesh, we need to come before Him and repent. He is faithful to cleanse our ministry and purify us for service. For Isaiah there was the burning coal that the angel brought to touch his lips. The great ministry Isaiah had happened after that incident. We must have a similar experience, to be cleansed of our own ways so that we may know Him and serve Him in a way that brings Him true honor and praise. Today, as of old, God is searching for those who will do His work in His way— those who will simply seek to know Him and minister out of their love for Him and as unto Him. Notice the statement, “to stand . . . before Me.” God was looking for just one person to simply “stand” before Him, to come into His presence and know Him. How I pray that the Lord would find in us a people who seek the greater thing—sitting at His feet in love and adoration, wanting simply to draw close to our Lord and know Him more. Only when we become people who live in His presence, continually listening for Him, will we be people fully equipped for every good work, able to carry out the ministry He gave us to do. This entry was posted in The Lord's Work Done in the Lord's Way and tagged Bible, Christianity, Discipleship, encouragement, gfa, Gospel for Asia, holy spirit, Hope, Jesus, Jesus Christ, K.P. Yohannan, kingdom of God, living water, ministry, Missionaries, Missions, service on June 8, 2010 by gfaseo. Why is doing the Lord’s work the Lord’s way so important? If the job is getting done, doesn’t that justify the means? Why is it so critical for us to continually take the time to wait upon Him and hear from Him, drawing close and living in His presence? Because when we do not, we are walking in sin. You see, there are two types of sin that we need to be mindful of. One is the sin of rebellion—we refuse to wait to know what the Master’s will is and do what we want to do with an independent, rebellious spirit, void of brokenness and humility. The second is the sin of presumption. This is where we run ahead with our own plans and in our own understanding, never taking the time to hear what He desires or to find out His ways. The prevention to each of these sins is found in waiting upon the Lord. You see, by choosing to come into His presence, we leave aside our agenda and prepare ourselves to submit to His yoke. In His presence we are changed; the independent spirit is substituted for His will and His ways. Our hearts change as a deep transformation takes place within. Yet it never happens overnight. This process of continually changing and becoming like the Lord only takes place as we take the time to be with Him, to sit at His feet and to gaze upon Him (see 2 Corinthians 3:18). It is in these times that we are emptied of ourselves and become one with Christ. We experience the joy and victory of knowing that the ministry we have received is from the Lord and for Him (see 1 Corinthians 4:1). It is through this that the Lord can manifest His life and His glory and carry out His purposes through our earthen vessels, just as Jesus allowed His Father to fulfill His plan through His life on earth. As we pull away from the busyness and all that can seem to clutter our lives and wait before Him, God removes us from ourselves and into His pure presence. By this our life and ministry are made pure, bringing Him true glory and honor. As a goldsmith purifies the metal in the furnace, so our waiting in His presence is the means by which the Lord purifies our soul. Hebrews 12:29 tells us that, “Our God is a consuming fire.” As we throw ourselves into His hands and abandon all that we are—all of our plans, ambitions, ministry, desires, everything—the knowledge of the Holy One, the Consuming Fire, invades every area of our being, purifying us. The knowledge of the Lord and the understanding of His ways gradually consume all that is earthly and of self. Even Job, the man acknowledged by God as the most godly and righteous person on earth, still had to go through this fire of purification. While his friends and wife did not understand the ways of God, he waited before the Lord, crying out, “When He has tried me, I shall come forth as gold” (Job 23:10, NASB). In her book Experiencing the Depths of Jesus Christ, Madame Guyon writes about this change that takes place as we wait upon the Lord, using nature as an example. If our outward actions are the result of a change that has taken place deep within our hearts—which comes from our intimate fellowship with Him—then what we do has spiritual value and lasts for eternity. “They speak visions from their own minds, not from the mouth of the LORD. . . . But which of them has stood in the council of the LORD to see or to hear his word? Who has listened and heard his word? . . . I did not send these prophets, yet they have run with their message; I did not speak to them, yet they have prophesied. But if they had stood in my council, they would have proclaimed my words to my people and would have turned them from their evil ways and from their evil deeds” (Jeremiah 23:16, 18, 21–22, NIV, emphasis mine). Notice how all this happened because they would not stand before the Lord. They were full of activity—prophesying, preaching, and so on—but it was not done out of standing before Him, ministering to Him or waiting in His presence. Their hearts and ministry were never purified, and the work they did did not flow out of love for Him. Their work was not done in the Lord’s way. The only way we can live a life and ministry pleasing to God is if we come His way—the way of listening, humbling ourselves and continually following. We who began well must be careful to continue on the right path. We must take the time to wait before Him, looking to Him alone until the whole divine presence comes and fills our soul. This is the only way we are prepared to serve others on behalf of our Lord. This entry was posted in The Lord's Work Done in the Lord's Way and tagged Bible, Christianity, Discipleship, encouragement, gfa, Gospel for Asia, holy spirit, Jesus, Jesus Christ, K.P. Yohannan, kingdom of God, living water, ministry, Missionaries, Missions, service on June 3, 2010 by gfaseo. It’s not always easy to wait. If we are honest, we will admit that we are usually restless when we have nothing to do. We need noises and things happening all the time. We want to be kept busy and have something to do at any given moment of the day. Most of us have difficulty just being quiet and still, waiting before the Lord. Why is it so hard to wait? Oftentimes it can be because our motive in the ministry is wrong. In the past, we have had a couple of families on staff with us who left the ministry because they were dissatisfied, feeling as though they were not doing what they considered “real” ministry. In one particular situation I remember a wife who said, “I came here to serve the Lord, and I have no ministry.” This family had two children to take care of, but for her, raising those children in the fear of the Lord, serving her family and being an intercessor for the lost world was not real ministry. She wanted to do something that appeared more significant. Please understand. It is good to long to serve God in the best way we can. But discontentment, discouragement, frustration and grumbling just because we don’t like what the Lord gave us to do is not good. We must be able to discern between truly desiring to please the Lord and our own restlessness and self-seeking. We must be able to discern what is motivating us in the work of the Lord. A lot of times we can be pulled in many different directions by the needs around us. And we can like it too. The work of the Lord certainly has its satisfaction for the flesh. There is the crowd of people, the results, the praise, the attention and the “thank-yous”—all of these can really make the flesh feel good. We definitely enjoy the attention, the limelight and the sense of accomplishment and self-worth that come in ministry. But what we are called to in serving Him must be rooted in pleasing Him and done out of our love for Him—not our own gratification and glory. It must be for His. In Ezekiel 44, we find two groups of servants of God. One group were the Levites who spent their days busy, busy, busy in the outer court of the temple serving the people who came to worship the Lord. These men were responsible for preparing the sacrifices and getting them ready for offering. Twenty-four hours a day, they were busy in the outer court, where it was full of people and noises. Many people saw the work the Levites were doing; it was a very visible thing. They were dragging the animals in, sacrificing them and putting them on the altar. These men were in great demand by the multitudes, pulled in all different directions, motivated by the screaming needs around them and all that needed to be done. But there was also another group—the sons of Zadoc. These were men of the inner court. Where they stood, there was stillness. Unlike the outer court, the inner court was silent. Deadly quiet. The only individual there was God. There was no busyness, no service in front of people, no demand but to come into the holy of holies and minister unto the Lord. Let me ask you—which group are you in? Are you like one of the sons of Zadoc, more concerned with coming into the holy of holies and ministering to the Lord than being busy serving the people? Or do you just keep going, going, going, moved in every direction with the busyness of the ministry? These are serious questions we must ask ourselves. This reminds me of the story of Martha and Mary in Luke 10:38–42 (NIV). It is clear in this passage, although our flesh would much rather be in the center of attention, that the better thing is to be more concerned with sitting “at the Lord’s feet listening,” rather than busy with all the ways we are trying to serve God. It wasn’t that Martha’s service was wrong. Not at all. What was wrong was that “Martha was distracted” from her first love by all of it. Jesus said Mary “has chosen what is better”—to leave the busy place of the outer courts and come into the inner court and minister to Him. But the truth is, we all have the same problem—wicked hearts. We’d rather be one of the priests who are busy standing before the people, active in what is immediately needed. We want our ministry to look dramatic and effective. Our flesh wants to glory in the praise of men. Just think about it. If asked to do a job that is below our educational qualifications or beneath our dignity, how glad are we? How eager are we to continue if the results are not what we would like? As humans, we often measure godliness and spirituality by external activities or a certain type of behavior that we see in people. The Pharisees were considered extremely spiritual people by the way they fasted and prayed and put on a humble demeanor. Yet we know how Jesus spoke of them, identifying them for what they truly were and pronouncing the worst judgment upon them (see Matthew 23:13). Despite how spiritual they looked, they did not know the Father. And without that, all their religious activity meant nothing. The motivation behind all their action was full of self, not love for God. The motive is what makes the work spiritual or unspiritual. We shouldn’t worry about how things look, what people might be saying, or whether or not there are the results we thought there would be. Our number-one concern must be to know Him and His ways and to follow His lead. When we live like this, what happens, whether good or bad in man’s sight, whether productive or useless in man’s opinion has no bearing. We are not working for human beings. We are doing it because of our love for Him. It is ministry unto Him, and this pleases Him. May we be reminded of the words of Paul, who facing incredible responsibilities, great need and overwhelming difficulties still said, “None of these things move me” (Acts 20:24). The difficulties and problems, all the blessings and praise, the good and the bad that happened, none of these things changed his course. Issues of personal life or loss did not sway him. All he wanted to do was the ministry the Lord gave him to do. Nothing else and nobody else motivated him. Please, we need to evaluate what our motive has been in serving the Lord. Are we seeking to meet the need around us, or are we seeking to know and please Him? Are we controlled, motivated and energized by our talents and by opportunities that present themselves? Do needs and others’ voices guide our course? Or do we really know, in our innermost being, that we are serving our King? Ask yourself these questions. Whatever we are doing, whoever we are serving, we must be able to do it all with the heart attitude that we are doing this for no one but our God. Please understand. I am not saying that it is better to forsake the work of the ministry to pursue the “deeper life” of just drawing close to God in solitude. There are some who give such great emphasis on this “deeper life,” yet so much of the actual work that God has for them goes neglected under the license of “waiting” upon Him. This can often just be a glorified laziness—and there are plenty of verses throughout Scripture that speak of the downfall of the sluggard (see Proverbs 21:25). If we look at the life of Jesus, we see He was extremely busy—traveling here, walking there, healing her, touching him, speaking from a boat, teaching on a hill. He used His time and opportunities to the maximum. Yet we also read, over and over again, how He would break away from the crowd and all the activity to be with the Father. His entire ministry, all of the seeming “busyness,” flowed out of His intimate relationship with the Father. My brothers and sisters, first thing must be first. It all comes back to this one priority: our love for Jesus. No matter how hard we try, no matter what methods we try, the service that pleases Him most is the service done out of love. This entry was posted in The Lord's Work Done in the Lord's Way and tagged Bible, Christianity, encouragement, gfa, holy spirit, Jesus, Jesus Christ, K.P. Yohannan, kingdom of God, living water, ministry, Missionaries, Missions, service on June 1, 2010 by gfaseo. All that brings glory to God and lasts in eternity must have its origin with God, not with ourselves. Ministry is something given to us by God. Jesus called the disciples to follow Him; they did not call themselves. Jesus called Paul. John the Baptist was a man “sent from God” (John 1:6, emphasis mine). Along with this, there is another principle present all throughout the lives of people mentioned in the Bible. Over and over again we see that waiting upon God precedes the unfolding of His plan or purpose. One example is seen in the life of Isaiah. It was as he waited in God’s presence that he received the call to be a messenger to the children of Israel (see Isaiah 6:1–9). This is also how it happened with the disciples’ ministry after the ascension of Christ. Scripture says, “[Jesus] commanded them not to depart from Jerusalem, but to wait for the Promise of the Father” (Acts 1:4). It was as they waited upon God that they received His call for their lives, and then they went out proclaiming His resurrection and salvation. Notice especially verse two—it was “as they ministered to the Lord” that they heard Him and found out His plan. It was not when they had a committee meeting (although there is nothing wrong with committee meetings). It was not when they met to discuss the tremendous needs (although that is a good thing to do). It did not happen because somebody challenged them and said, “You had better get out there and do something about all those lost people.” It was not when they did something that was a nice, wholesome, well-planned and thought-out thing to do. It was as they waited upon the Lord. It is encouraging to know that before the world began, God knew the purpose and plan that He has for each one of us (see Acts 17:26). Whether our human mind and our logic can grasp it or not, it is true. ‘‘ ‘For I know the plans that I have for you,’ declares the LORD, ‘plans for welfare and not for calamity to give you a future and a hope’” (Jeremiah 29:11, NASB). However, like Isaiah, Jeremiah, Saul and Barnabas, we only learn of the plans He already has prepared for us as we take the time to come into His presence and hear from Him. There is also another principle we see all throughout Scripture, one that I am much more concerned about. That is, we must remain in the attitude of waiting upon the Lord. One incident in David’s life perfectly illustrates the importance of this. And so, after hearing from the Lord,David did what He said, and he was victorious. A few verses later, David is faced with an almost identical circumstance. Once more the Philistines had stationed themselves in the same valley, and once more, they were waiting to attack Israel. “You shall not go up.” Do you see that? God had a different plan this time, and David only learned of it because he lived in the atmosphere of waiting upon God, to hear from Him and obey. By this, his ministry was done in connection with Him and unto Him. There is the requirement that as we continue in the journey the Lord has us on, we must stop often along the way and find out what He is saying. By doing this, our love for the Lord stays strong, the ministry that began out of that love for Him remains in Him and the work done is accomplished in His way. There are hundreds of Christian organizations, churches, groups and ministries that began so well. But somewhere along the way, somehow, a lot of them stopped waiting upon the Lord, causing their love for Him to grow cold. As a result, their ministry ended up in the flesh, and once again the Scripture is fulfilled—“Are you so foolish? Having begun by the Spirit, are you now being perfected by the flesh?” (Galatians 3:3, NASB). God addresses this same issue with His prophets in Isaiah 29:13 (NIV), saying, “These people come near to me with their mouth and honor me with their lips, but their hearts are far from me.” They may look real and authentic; they may have started well; their service may appear genuine, but it is not. It cannot be because their hearts are now far from Him. When we stay in the attitude of continuous dependence upon God, what has begun in the Spirit remains in the Spirit and bears lasting fruit. Doing the Lord’s work in His way is of paramount importance. If we continue the work without His direction, leading and strength, it won’t be His work at all. It will be only a hollow shell that might look all right but in reality has no life and bears no lasting fruit. We must come into His presence and wait upon Him, to hear from Him and know His ways. This entry was posted in The Lord's Work Done in the Lord's Way and tagged Bible, Christianity, Discipleship, encouragement, gfa, Gospel for Asia, holy spirit, Jesus, Jesus Christ, K.P. Yohannan, kingdom of God, living water, ministry, Missionaries, Missions, service on May 27, 2010 by gfaseo. And the work I give not pass by. Recently in our ministry, there has been a spiritual renewal taking place in the lives of our leaders on the mission field. As a result, these leaders have called for 90 days of continuous chain-prayer, involving thousands of people, to seek the Lord for greater spiritual reality and renewal among those who serve with us. It all began when some of our senior leaders met for four days of planning and consultation concerning the ministry and what needed to be done. Because the work is growing so fast, we remain with only one thing that is permanent—change. Every two or three years, new systems need to be deployed to handle the increase. People have to be transferred. Strategies must be reworked. It is often out of sheer necessity and urgency that these meetings are called. Several meetings were scheduled throughout the Indian subcontinent, with the first one taking place in North India with 25 leaders present. As usual, their time started off with the first few hours of the first day’s meeting in a time of worship. The room was filled with worship and prayer, but as time went on, the prayers wouldn’t stop. They continued on into the evening, and the Lord’s presence became very real in that place. God began to speak through one of the senior leaders in attendance. With a specific word given to him, he spoke what the Lord was saying to the leaders individually. The Lord knew just what each one was facing in their lives and ministry, and He exhorted them and spoke the exact word needed at that time. There was no judgment, no condemnation in what God spoke to them. But those words changed the entire agenda for their meeting. Instead of seeking solutions on how to handle the work, their first priority became just to stay in the place of prayer and worship and draw closer to Him. At the next meeting place, a similar incident happened. God began to speak the exact same message through someone else. Discerning that this was a serious matter on the heart of God, the leaders called for everyone throughout our work to take time and personally seek the Lord concerning this message. I know your works, your labor, your patience, and that you cannot bear those who are evil. And you have tested those who say they are apostles and are not, and have found them liars; and you have persevered and have patience, and have labored for My name’s sake and have not become weary. Nevertheless, I have this against you, that you have left your first love. Remember therefore from where you have fallen; repent and do the first works (Revelation 2:2–5, emphasis mine). In the midst of intense work and ministry, the Lord was saddened. Why? Because their love for Him was fading away. Nothing about their ministry had changed. The Lord said that He had seen their work, their labor, the patience and endurance that they had in it all. He commended them for their work and the lives they were affecting. But somehow, in it all, their hearts had changed. My brothers and sisters, we can be in the same danger. The ministry that was first done unto Him and out of their love for Him now began operating under a different intent. If we are not careful, we can become so consumed with serving the ministry God gave us and forget the Lord Himself. 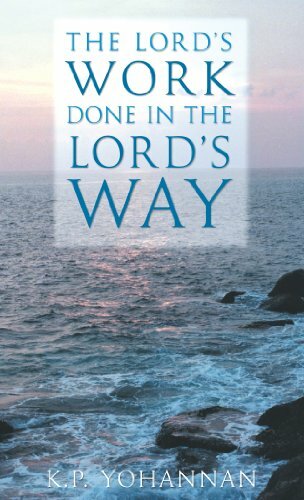 What is doing the Lord’s work in the Lord’s way? We must properly define it so that we may be able to attain it. Christian ministry, by nature, affects and benefits humanity. We serve God by serving people. The ministry that God has called you to is never isolated from the people He has placed in your life. However, there is a balance that must be kept in Christian service. It is not just a balance of external priorities, what is done first and what is done second, but one that runs much deeper and is the well out of which all ministry springs. It is the attitude of the heart. Doing the Lord’s work in His way is living in the awareness that whatever we are doing, whatever ministry the Lord has called us to, forever we maintain the understanding that we do it unto Him. Our service must be rooted in Him, motivated by our love for Him and done with the desire to exalt His name and His name alone. There will come a time when each of us and the ministry the Lord gave us to do on this earth will be tested by fire (see 1 Corinthians 3:13). Only that ministry which was done in His way will last. It does not matter what it may have looked like on this earth, it does not matter how well-known it may have been or how much fruit it may have seemed to produce. If it was not done as unto Him, it was not done in His way . . . and it will not stand in eternity. My brothers and sisters, I share this message with you soberly, knowing how easy it is to run about with our own ideas and our own agendas. Everything can look so good and we can seem to be running on the right track. But if our understanding toward ministry has moved from being one of ministry unto Him to getting results, building a name and serving the people, we are dangerously off course. How is it that, even in ministry, we can lose our first love? It all begins when we neglect to come into His presence and sit at His feet. It is in His presence that we grow in our understanding of Him and His ways, and are equipped to go and carry out the ministry He gave us to do. Our lives take on the atmosphere of living moment by moment waiting, listening for His voice and being sensitive to Him, seeking to do what He desires. But when we walk away from this, unfortunately it doesn’t mean that all ministry screeches to a halt. In fact, the “ministry” can seem to carry on as usual. The need is still there. The people are still there. Yet when we choose to carry on without waiting before Him, we take the first step off of the right road. We may take well-meaning actions to see the ministry continue, but they are independent actions if not born out of His presence. One of these well-meaning actions, for example, is taking on work that God did not give to us, just because the need is so great, the opportunities seem unlimited, and we are driven by urgency. I know for our ministry, the need is absolutely huge, mind-boggling. We need to get the Gospel to so many people before they die and are lost for eternity. So it is logical and reasonable to be absolutely committed and fully involved in doing everything we possibly can to reach the lost. But if we do this independent of Him, our love for and intimacy with the Lord begin to fade away and our ministry cannot be pleasing to Him, no matter what kind of fruit it is producing. Another independent action that results in the loss of intimacy and love for the Lord is when we fail to stop and ask Him how He wants His work to be done. Oftentimes, meeting the current needs becomes more important than how ministry is done. It is in response to necessity that we often create new structures, new systems, new leaders and new training, and we just keep being pulled in all kinds of directions. It is easy to be so consumed by the immediate that it eventually becomes the focus. We can be spending all our time trying to get the track built for the train to run on, trying to organize and facilitate, yet never stopping to consider that maybe the Lord doesn’t need all these structures and plans. Maybe He has all kinds of other ways to do this ministry. But we are so consumed with our business mind and structure and logic that we just keep on doing things in our own ways. We have often seen how God, in His mercy, steps in, like in our leaders meeting, and changes our plans, setting first thing first. I am so thankful that the Lord had the freedom to come to us in that way even when none of our leaders expected it. It is a relief to know He is with us, watching over the work. It was like spending a day out in hot, humid summer weather and finally getting a good, cool shower. It is refreshing! “Ah yes!” He is with us and He is leading us. At the same time, I was made aware that we must be careful and concerned about how we proceed in serving the Lord. By no means do I want you to think I am saying we should stop our work and not do what we are doing. That is not how it works. In fact, it seems the more we take the time to wait and hear from the Lord, the more actual work that we do—but rather in His strength, not ours. This is how the Lord’s work is done in His way—by loving Him more than the ministry He gave us to do, by waiting in His presence to hear His voice and by continuing in that sensitivity to Him so that we are always doing His will, in His strength. This entry was posted in The Lord's Work Done in the Lord's Way and tagged Bible, Christianity, Discipleship, encouragement, gfa, Gospel for Asia, holy spirit, Hope, Jesus, Jesus Christ, K.P. Yohannan, kingdom of God, living water, ministry, Missionaries, Missions on May 25, 2010 by gfaseo. I spoke this message to our fellowship on July 30, 2002. It was one of those days especially set apart for prayer and waiting upon the Lord. We began with hours of worship and adoration, during which the Lord became very real to us. What I share here was the result of a growing burden God gave me during that time, calling us to remember once more that we must continually draw near to Him, to hear Him and grow in our love and understanding of Him. To try to do any ministry apart from this is a sad mistake. Our emphasis—no matter what we do—must always be to know the Lord and His ways. Only then can the work be done in total dependence upon Him. Only then can our work bring Him glory. May the Lord draw you closer to Himself as you read this. This entry was posted in The Lord's Work Done in the Lord's Way and tagged Bible, Christianity, Discipleship, encouragement, Gospel for Asia, holy spirit, Jesus, Jesus Christ, K.P. Yohannan, kingdom of God, living water, ministry, Missionaries, Missions, service on May 20, 2010 by gfaseo. When We Have Failed – What Next?